Should I File A Petition? What Are My Chances Of Success? If you look at the numbers alone, your chances appear to be limited since the Court denies the vast majority of cases for review. In fact, statistics show that you have less than a one percent chance of having your petition granted. However, these numbers do not tell the whole story. They include thousands and thousands of frivolous petitions - most filed by inmates at various penal institutions. Accordingly, if you remove the frivolous petitions and only look at the ones that are filed with "legitimate issues," then the statistical odds improve to about 10 percent. But that also is not the whole story because roughly one-half of the cases heard by the Court involve federal or state issues and/or constitutional, civil rights or criminal matters. So if your case involves a civil business issue your odds are better than at first glance but still not good. However, you never can tell when lightning will strike and we, at Counsel Press, do prepare a very substantial number of briefs on the merits. When we are discussing "legitimate issues," you should keep in mind that we are not necessarily referring to issues of world shattering import because many of the cases taken by the Court deal with seemingly pedestrian matters. And it goes without saying that all "legitimate issues" are not equal and some have a greater chance of being heard than others. When Must A Petition Be Filed? A petition must be filed within 90 days of the date of the entry of the judgment sought to be reviewed but, if: a) a timely petition for rehearing or review has been filed by any party; or b) the lower court either appropriately entertains an untimely petition for rehearing or sua sponte considers rehearing, then the 90 day period runs for all parties from either the denial or, if granted, the subsequent decision. (See Rule 13) N.B. It is 90 days and not 3 months; the date of any mandate does not enter into the calculation; and this period is jurisdictional in all civil cases. How Difficult Is It To Obtain An Extension of Time? Extensions of time (up to 60 days) are covered by Rules 30.2, 22, 33.2 and 34. It depends not only upon your reasons and the timing of the request but also what area of the country your case is coming from and who is the sitting Justice for that area. The degree of difficulty in obtaining an extension varies from Justice to Justice and appears to range from virtually impossible with some to generally not a major problem with others. For a further discussion and some suggestions as to form, you may wish to contact us. What Will A Petition Cost? The cost of petitions vary dramatically and depend primarily upon the length of the appendix. However, we are able at the outset to provide an accurate estimate of the total printing costs once we have had an opportunity to speak with one of the lawyers involved in the preparation of the petition. We find it is generally not helpful to have a support staff call and ask the cost of a petition, as more often than not there are legal decisions that have to be discussed with regards to determining which documents to include, which will affect costs. What Should My Appendix Contain? Rule 14 governs the content of your appendix. It mandates that all relevant decisions, findings of fact and conclusions of law must be included. Besides that you also have the option to include any material you believe essential to the understanding of your petition. Therefore, the appendix is only limited by the record below and you become the ultimate arbiter of what goes into it. As a general rule, we recommend that you include only what is required. If the Court is not interested in the area of the law covered by your petition, it will certainly not be interested in the underlying facts. The Court will also assume what you have said is correct and if the respondent says otherwise you always have a reply brief in which to include whatever supporting documents you feel are necessary. And finally, the Court has the authority (which it does exercise) to call up the record from the court below which enables you to cite or quote from anything in the record without including it in your appendix. (Rule 12.7) But the decision is always yours. 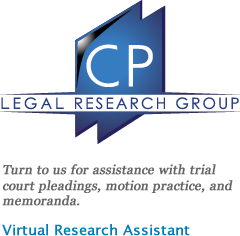 Our goal is simply to help minimize your cost without sacrificing the strength of your legal arguments. Do You Have Any Sample Petitions? We always have samples available of recent petitions we have worked on which the Court has granted cert. We also have samples of Cross Petitions and Conditional Cross Petitions, as well as just about any other document you can think of. Since the issues and facts in your case will no doubt be different, the primary benefit of a good sample is in its form -- to see how a petition has been properly laid out. We do not provide legal advice, but we will review your draft petition and point out any problems we may see. And we are also available to discuss tactics and strategy. N.B. The most important element of your petition is the "Questions Presented" page. How Long Will It Take The Court To Decide? The vast majority of petitions are ruled upon within 3 to 12 weeks of docketing. Initially, the respondent controls the timing. For instance, the respondent could waive filing an opposition brief upon receipt of the petition in which event your petition would be circulated immediately and the Court might rule as quickly as within 3 weeks. On the other hand, the respondent could ask for an extension of 30 days (added to the initial 30 day period) to put in an opposition brief so that a decision by the Court could be put off for at least 12 weeks from the docketing date. Once circulated, most petitions are disposed of within 2 1/2 weeks. However, some languish for months for a variety of reasons. In the final analysis, it is their Court and their ball. The Counsel Press Supreme Court team offers our clients expert service from petition to briefing on the merits. All the Counsel Press Supreme Court staff have at least 15 years experience. 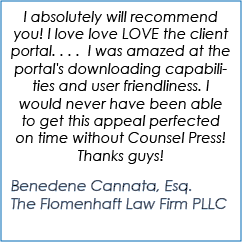 At Counsel Press, you will always work with bright, savvy, attorneys and paralegals that focus exclusively on United States Supreme Court procedure. The Supreme Court has some ambiguous rules, some misleading rules and even some unwritten rules. We not only know what the rules mean, but also how the Court interprets and enforces the rules. Counsel Press knows what must be done and when. When asked a question, others will suggest you call a clerk. We tell you the answer.